With a reputation for being Honest, Thorough, and Proven, let us help you with your inspection needs. We want you to know that you're hiring a professional, experienced, and knowledgeable home inspector for one of the most important decisions you could make! With over 150 hours of education completed over this last year alone, along with our principle that one can never learn too much, here at On The Mark Home Inspections, LLC, we know that it is important to always keep up with the evolution of the home inspection industry. Check out our certifications. 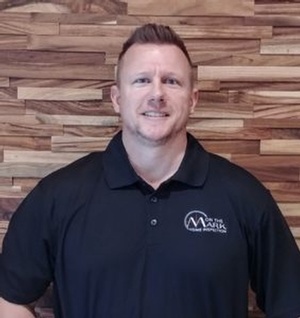 Prior to starting On The Mark Home Inspections, LLC, Mark was a Large Loss/General Adjuster in the insurance industry for 15 years, having completed over 8,000 inspections for residential and commercial properties in 22 different states, working claims for everything from 500 square foot condos to 50,000+ square foot hotels. His attention to detail, as well as his love for field inspections, led him to start his new venture into performing home inspections for his clients. Originally from the Kansas City metro area, Mark has been in South Florida for a little of two years with his beautiful wife and daughter. He enjoys taking advantage of the awesome beaches and abundant golf course SE Florida has to offer! Choosing the right home inspector can be difficult. Unlike most professionals you hire, you probably won’t meet me until your inspection appointment--after you've hired me. Furthermore, different inspectors have varying qualifications, equipment, experience, reporting methods, and pricing. One thing that’s certain is that a home inspection requires a lot of work. Ultimately, a thorough inspection depends heavily on the individual inspector’s effort. If you honor me by permitting me to inspect your new home, I guarantee that I will give you my very best effort. This I promise you. If you are not completely happy with our services, we will refund you the full cost of the inspection, no questions asked. Here at On The Mark Home Inspections, we will strive to make sure you are 100% satisfied with Our Services. How can we do this you must ask? Simple – by experience and by being thorough. With that, we take pride in what we do, so that our experience can determine the difference between a costly defect, or a simple fix. We feel so confident with this that we can back it up with this guarantee. Consult On The Mark Home Inspections, LLC - Certified Home Inspector in Palm Beach County, Florida.